The Global Agricultural Drones Market is expected to reach $ 15 billion by 2023 and is forecasted to grow at a CAGR of more than 9% during 2018 to 2023. At present, medium sized drones is getting traction for analysis purpose from agricultural industry. Whereas larger drones are being employed for the planting and spraying applications. Drones are the future of agricultural industry and its adoption is expected to increase from medium to long term. Agricultural drones are used in farming to monitor the crop growth and to increase the crop production with the help of innovative sensors. These information which is gathered from the equipment might be useful in developing crop yields and farm efficiency. Aerial view can show many problems such as soil variation, irrigation issues, pest & fungal problems. This shows the farmer to realize the exact differences between healthy and unhealthy plants. These perspectives helps to assess the crop growth and production. Pictures can show the changes in the crops for every particular period of time, this shows the predicted trouble spots. The benefits of agricultural drones enables to guide with quick availability of information and reduce operational costs. Global demand for this market is driven by factors like increasing trends of advanced and automated farming practices. This report incorporates an in-depth assessment of Global Agricultural Drones Market by Type, Components, Battery Life, Applications and Geography. What are the Applications for Global Agricultural Drones Market? The various assessed applications include Crop Analysis Applications, Field Mapping Applications, Agricultural Photography, Crop Spraying, Live Stock, Variable Rate Application and Field Mapping. Field Mapping is used extensively as it collects the data of forest ecosystems during field analysis. It’s also used in inclinometers, GPS and Laser Rangefinders. Precision agriculture with the use of GNSS, GPS & drones, improves the farm yield and helps the farmer to realize which crop is most suited in terms of geological conditions and soil quality. Technology has also became one of the factor where farmers take precautionary measures in advance in case of unforeseen vagaries of nature. Farming is balanced to be at the leading edge of innovative technology with the help of these growing companies. This aspect indulges in investing more in the enterprises to remain competitive and more such innovative projects are predicted to launch in future. Syngenta acquired FarmShots, a North Carolina based company for an undisclosed amount. These FarmShots uses the high-resolution satellite and a drone imagery to the deliver plant health analyses. This is offering an insight about the field conditions based on various patterns of the light absorption. These startup have raised $1.1 million seed round from local investors. FarmShots will operate under Syngenta’s digital portfolio. At present, this platform registers data for eight million acres, a number which Syngenta wants to increase as it enhances the product worldwide. 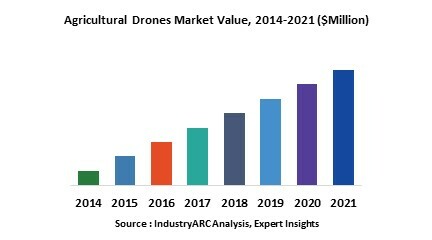 Who are the Major Players in Global Agricultural Drones Market? The companies referred to in the market research report includes 3D Robotics, DJI, Precision Drones, Ageagle LLC, Agribotix LLC, Honeycomb Corporation, Yamaha Motor Co., Ltd., Delair-Tech SAS, Trimble Navigation Limited, HUVRData, LLC and more than 20 companies.